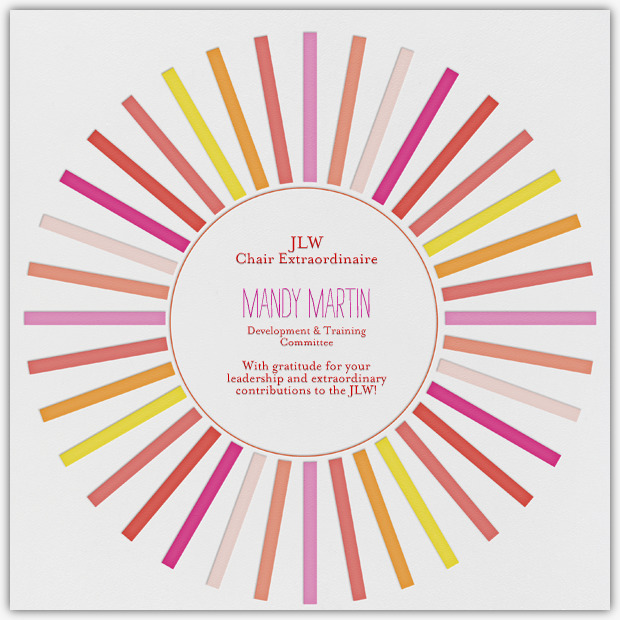 We are proud to honor Mandy Martin, chair of Development and Training, as JLW Chair Extraordinaire. An eleven-year Active, Mandy has brought exceptional energy, organization and direction to this year’s trainings. Her can-do attitude, strategic vision and winning smile have greatly enhanced the experience not only of her committee members, but also the JLW as whole. Mandy and her team have brought the training portion of our mission to life this Centennial year. Congratulations, Mandy and keep up the good work! Did you know there are more than 125 leadership positions in the JLW? Each year, an amazing group of women answer the call to serve and their talent and skills form the support structure upon which our organization runs. Just as we value and appreciate your membership, we appreciate their service. The JLW Chair Extraordinaire is a new award for our Centennial year. Each month, council directors may nominate a leader for consideration and one chair will be recognized by the president.